Meaning of Last Name Print. Give something to your client that will really wow him or her- the meaning of last name print is perfect as a birthday gift, anniversary gift or an appreciation gift for their business. 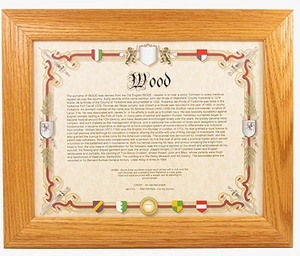 This print comes framed, and spells out the meaning of their last name, crest and motto. If the last name is not in our database, we will notify you immediately. Contact Us for a price quote.